thanks for this -- I'm going shopping now! I loved this one, too -- particularly the CD with recordings of Tolkien and Ogden Nash and Langston Hughes. Loved the selections, really loved the recordings (some of which are of poets reading their own poems and some of which are of others reading poems not their own), hated the illustrations. I prefer Caroline Kennedy's A Family of Poems: My Favorite Poetry for Children illustrated by Jon Muth. 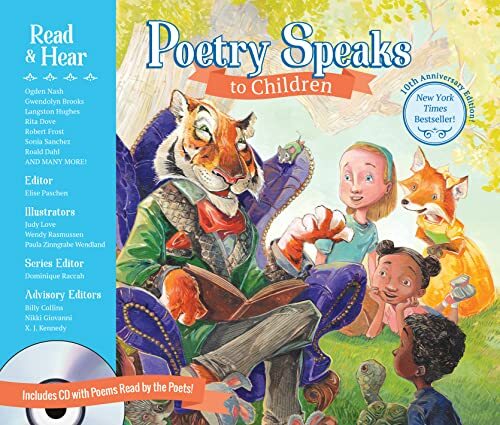 The poems are wonderful (and as far ranging as in Poetry Speaks to Children), Kennedy's introductions to each section are perfect and Muth's illustrations are gorgeous. You can hear a lot of poets, living and dead, read their works at the poetry archive. The children's section is quite extensive.